Determining how an employer develops the most effective formulary, while protecting the financial stability of the plan, is certainly the challenge of this decade. Prescription management used to mean monitoring that the right people are taking medications to control their disease while creating strategies to move them from brand name to generic medications. With the dawn of specialty medications, formulary management has become a game of maximizing the pass-through of rebates, creating the best prior authorization strategies and tiering of benefits to create some barrier to more expensive medications, all without becoming too disruptive. As benefits managers know, that is a difficult challenge. The latest UBA Health Plan Survey revealed that 53.6 percent of plans offer four tiers or more, a 21.5 percent increase from last year and nearly a 55.5 percent increase in just two years. Thus, making “tiering” a top strategy to control drug costs. There are many additional opportunities to improve and help control the pharmacy investment, but focusing on the key components of formulary management and working on solutions that decrease the demands for medications are critical to successful plan management. When developing a formulary, Brenda Motheral, RPh, MBA, Ph.D., CEO of Archimedes, suggests that chasing rebates is not a strategy to optimize your investment. Some of the highest rebates may be from medications that add no better therapeutic value than an inexpensive medication that does not offer a rebate, but net cost is much lower than the brand or specialty medication being offered. Best formulary management will mean that specific medications that do not offer a significant therapeutic value are removed from the formulary, or are covered at a “referenced price” so the member pays the cost difference. Formulary management will need to focus on where the drug is filled and which medications are available. When setting up parameters on where a drug is to be filled, the decision needs to be made if a plan will promote mail order. Mail order, if used and monitored appropriately, makes it more convenient for a patient to receive their regularly used medications and may provide savings. In fact, the UBA Health Plan Survey finds that more than one-third (36.3 percent) of prescription drug plans provide a 90-day supply at a cost of two times retail copays. But if mail order programs are not monitored, people can continue to receive medications that are no longer required and never used, adding to medical spend waste. Furthermore, in our analysis, we are finding that not all medications are less expensive through mail order, as shown in Figure 1 below. Therefore, examining the cost differential is critical in a decision to promote, or not promote, mail order. Another formulary consideration is in monitoring the increase in same drug pricing. The stories surrounding the price increases of EpiPens® has been well-documented, but how well do you understand the impact of price increases on your plan? Monitoring price increases, as shown in Figure 2, may help an employer turn to their pharmacy benefit manager (PBM) to ask for help in controlling these price increases, or help in decisions related to formulary inclusion. Formulary management solutions can become a cat-and-mouse game. The ultimate approach to manage the total spending on medications is by managing the growing demand. There has been significant press related to the opioid overutilization in the U.S., as illustrated in the article “Prescription Addiction.” But that issue is much broader in our society and relates to taking a pill as a quick solution to solve our medical problems. In March 2016, the Department of Health and Human Services (HHS) stated that 30 percent of the growth in spending related to medications was due to an increase in prescriptions per person. Certainly, medications should be used when there are no alternatives to control disease or pain. However, turning to medications as a first option for chronic condition control for issues like hypertension, blood sugar control, cholesterol control versus improving diet and exercise, etc., is just a band-aid solution that, in most cases, does not resolve the root issue. Yet, because this is sold as a quick fix, we see an increase in the number of individuals on medications. 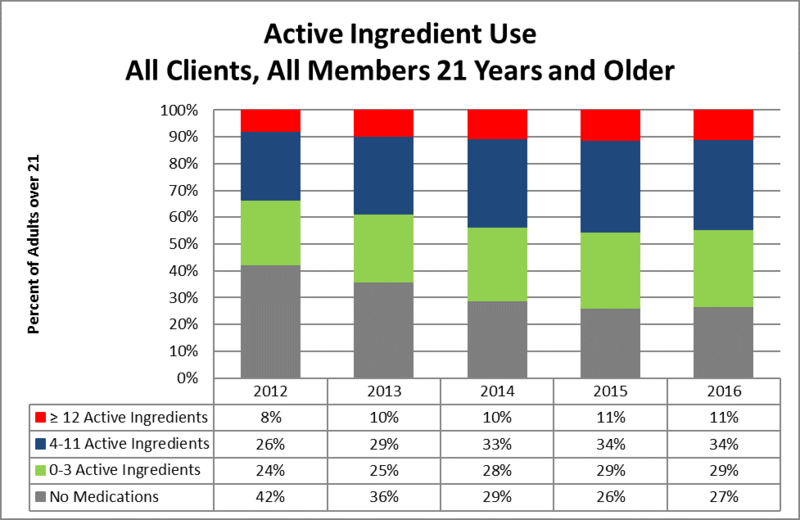 In 2012, 34 percent of plan members engaged in Vital Incite were taking four or more (active ingredients) medications, and that has grown to more than 45 percent in 2016. The data also illustrates that in 2012 more than 42 percent of members were not on any medications, but that group size has shrunk to only 27 percent. No formulary can impact this issue. This increased use could be considered an improvement in care if their disease were more controlled. Appropriate and medically-impactful utilization would mean that a person is working toward improving diet and exercise and is taking the least expensive, yet effective, medication to control his or her disease. Considering that diabetes medication options have really expanded, an employer would hope that the more expensive medication is providing the best control of disease. But, taking the medication alone will not control the disease and, at times, the progression of the medication cost can be related to progression of the disease due to a lack of disease management. For instance, a diabetic may have progressed from taking metphormin (marketed under the tradename Glucophage® among others), which costs approximately $27 per month, to metphormin ER (Glucophage® XR), which allows a person to take only one pill a day, so it may provide increased compliance, but costs $274 per month. Now, the option of taking Glumetza® is offered, which can be reimbursed at up to $3,620 per month, and is said to provide more stable results. But, if we examine the A1c control values from Vital Incite, do we find the reduction in A1c values as evidence that this additional investment in medication options is providing better control? Figure 3 provides an example of A1c control by prescription status. The goal would be that those on medications will become controlled. But, in our data, we are not seeing a significant improvement in persons with HgA1c levels above 7 percent. Control is achieved from diet, exercise, and appropriate medications. There are theories that people on these more expensive medications are using that as an approach to help them maintain their unhealthy behaviors. Therefore, taking medications alone does not appear to provide an effective solution and, in fact, providing chronic condition medications for free, without requiring any other effort, may not be the best investment for an employer. In conclusion, determining which issues are having the most impact on an employer group will allow benefits managers to determine the company’s priorities. This is not an easy task, but with pharmacy spend increasing at a national average of 7.3 percent annually and becoming a higher percentage of the overall medical spend, new strategies need to be considered. Focusing on the key components that balance formulary management with the correct approach to manage the demand on medications can influence total pharmacy spend. Dear Ron, Thank you so much for generously supporting [us] and our AIDS walk team this year. It was a lovely foggy Sunday morning in Golden Gate Park, with thousands of folks walking to fight AIDS. It has been a pleasure working with you over the years. You have saved us LOTS of money! I want you to know how much we appreciate all that you do!